Yep, it's another keyword dilemma, and another article to go with it! This week the focus is entirely on the Klingons and their politicians. So, what can the Klingons get for themselves if all the politicians work together? Answer: Apparently, just about anything! This new dilemma enhances an old popular decktype by building on an old theme. And by building your deck around it, your Klingons can learn from the Ferengi. Never pay full price for anything. In this case, you should never have to pay to draw a card again. Let's start by taking a look through the options of people with these two related keywords. We've got six High Council Members (though Kell is technically Romulan, so he only counts if you use Interstellar Treaty). 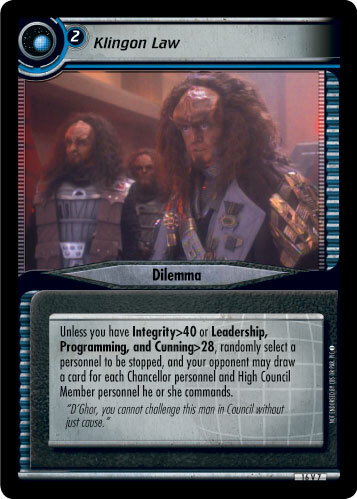 We've also got eight Chancellors (though three of those are Gowron, and Martok appears on both lists). Therefore, in total, we can get ten or eleven applicable personnel in play. That's more cards than you can hold onto for very long, so that should be plenty of card draws for anybody's purposes. Now surely when I was talking about never paying for a card draw again, I wasn't just referring to those card draws you can get a couple of times a game, was I? Nope, because something that all these Klingons have in common besides triggering those draws is their ability to download cards as well. High Council Members K'mtar and K'Tal each get event downloads (K'Tal even triggers a download every time another High Council Member or Chancellor is played! ), while Chancellor Gowron gets to download a Klingon. Add in Kang, Koloth and Kor for their mutual downloads, and you're really running out of reasons to ever pay to draw a card. If you still need more free downloads, try out Kargan and Koroth as well. So, what are you going to do with all these events and other cards in hand? Well, one of the first events is obviously going to be Guidance of the Council, just to download cards even faster. With that and everything else up and running, your hand will seldom be empty. And if you ever draw the wrong card, K'mpec or Mara can help you with that by cycling on to the next one. And then Chancellors Martok and Worf will use those events and personnel in hand to keep your attributes nicely boosted. Of course, the thing is...none of these are new tricks. But I told you that right from the start; this particular dilemma isn't so much opening up a new decktype as it is enhancing an old one. So, what can this card do that you couldn't do before? I'd recommend stocking lots of Reprogrammed, for one. When you suddenly get eight to ten card draws during your opponent's mission attempt, the chances of your drawing into a Reprogrammed and an extra personnel just increased dramatically. How about running it with Counterinsurgency Program? You've already got lots of events in your deck, and now you've got a chance to draw a handful of them right before your opponent hits this dilemma. Lots of discards means lots of chances to stop people. Gorgan comes into play again, this time on the opposite side. You just drew a bunch of cards, so the odds are good that one of them will be pretty expensive. Of course, there's just the basic fact that, well, cards are good to have, so the more cards that you can draw for free, the better. Right? Next time... Ferengi don't like business competition, and they'll use any means they need to in order to wipe it out.